Tyree was the player of the game, tying his season-high of 31 points. The Somerset, New Jersey native scored at least 20 points for the fifth straight game, becoming the first Rebel to do that since Stefan Moody had 14 straight 20-point games (Nov. 25, 2015 – Jan. 28, 2016). In the first half of the contest, Tyree also scored his 1,000th point as an Ole Miss Rebel. 1H 8:05 | Making his first FT of the pair, @Breety5 becomes the 40th Rebel in school history to score 1,000 career points. He makes the 2nd to give the Rebels a 2-point lead. Congrats Breein! The first twenty minutes of play began with both teams shooting the lights out in Stegeman Coliseum. The Dawgs and Rebels traded 3-balls back and forth until the first media timeout, at which point Georgia had a 7-point lead, 15-8. 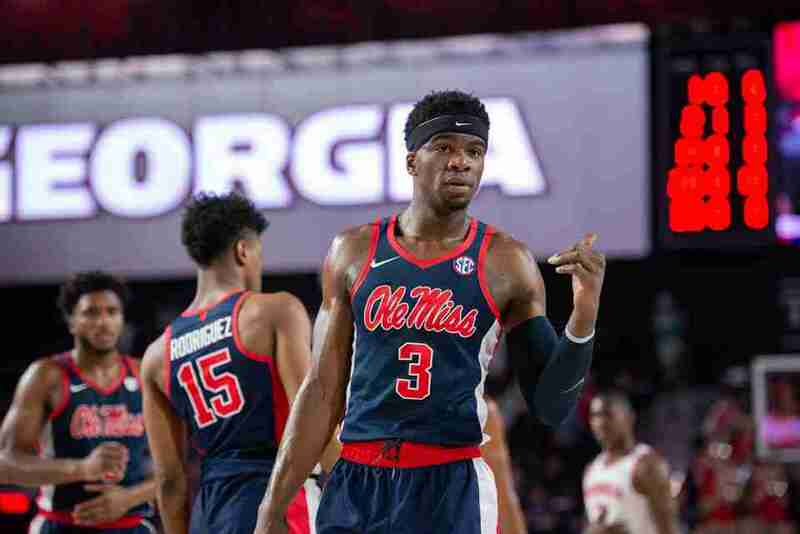 Following the timeout, Ole Miss (16-7, 6-4 Southeastern Conference) was able to take advantage of a couple of Bulldog turnovers to tie the game at 20 with just over 11 minutes left until halftime. The Rebels, on the back of a 14-2 run, were able to take their first lead of the game on a Terence Davis mid-range jumper and then extended their advantage with the help of a Tyree 3-pointer. But the Dawgs’ offense continued to push and tied the game with Georgia’s fifth 3-pointer of the game. Late in the first half, the Rebels went on a 13-3 run. Center Bruce Stevens’ two free throws and medium-range jumper ended the half with Ole Miss on top, 45-33. 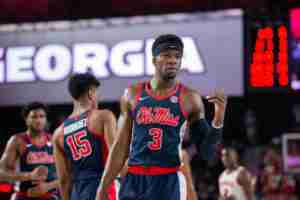 Georgia’s 15 turnovers—and the 16 points the Rebels notched as a result—were key to Ole Miss’ success late in the opening half. Tyree dominated with 14 points in the first 20 minutes, while Devontae Shuler and Terence Davis had 8 and 7 points, respectively. Meanwhile, Stevens was not only able to establish himself down low with 4 early points, but he was also able to collect 6 first-half rebounds. The second-half began exactly like the first as Georgia (10-13, 1-9 SEC) hit the opening 3-pointer and cut the Ole Miss lead to nine. That margin stuck for a few minutes, but when the whistle blew for the under-sixteen media timeout, Ole Miss had grabbed a double-digit lead thanks to two more Stevens free throws. Tyree’s fourth offensive rebound of the game and ensuing basket allowed him to put Ole Miss up by a game-high 15 points. 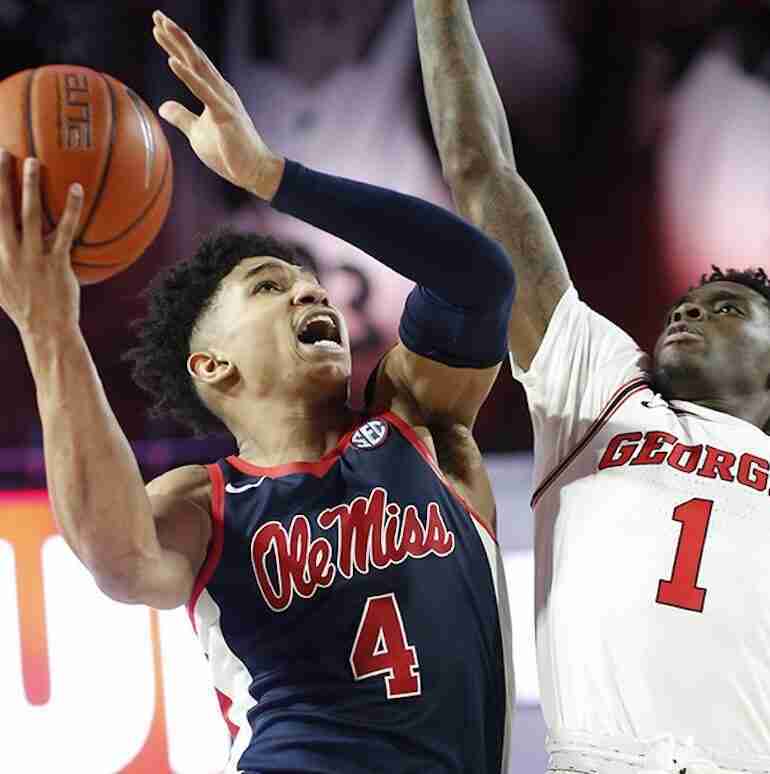 The Rebels kept the pressure on Georgia, while also keeping their double-digit lead, and with only 8 minutes remaining in the game, Ole Miss held a 64-49 lead over the Dawgs. Georgia tried to grab some momentum; however, the Dawgs’ 19th turnover of the game rendered their efforts useless, and Ole Miss kept the lead at double-digits with a clutch Tyree three that put the Rebels up by 16. Tyree continued to impress, scoring 10 of the Rebels’ last 13 points before the final buzzer sounded with the Rebels on top 80-64. Tyree finished with 31 points on 11-for-22 shooting, including three from long range. After scoring 14 points in the first half, he added 17 in the final 20 minutes. “When I have that much space, it’s hard to stay in front of me,” Tyree said after the game. Guards Shuler and Terence Davis and forward Blake Hinson all had solid offensive games, with Hinson (13 points) and Davis (12) both breaking into double digits, while Shuler scored eight. Stevens had nine rebounds, including a game-high four offensive boards to help provide the second-chance scoring opportunities. He also added 6 points in the game. Ole Miss snapped a three-game skid against the Bulldogs and won in Athens for the first time since Jan. 21, 2012. The Rebels held a 21-5 advantage in second chance points. With the help of 10 steals, Ole Miss forced 20 turnovers that lead to 19 points. Making a free throw at 8:05 left in the first half, Breein Tyree became the 40th Rebel in history to score 1,000 career points at Ole Miss. Tyree registered his second 30-point game of his career, tying his career high with 31 points. Tyree scored at least 20 points for the fifth straight game, becoming the first Rebel to do that since Stefan Moody had 14 straight 20-point games (Nov. 25, 2015 – Jan. 28, 2016). 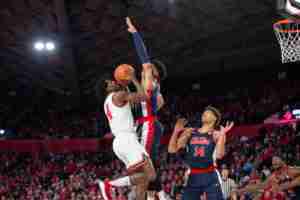 On his birthday, Devontae Shuler scored eight points and had seven rebounds. Bruce Stevens pulled down a season-high nine rebounds. The Rebels stay on the road as this coming Wednesday they make the trip to Auburn, Alabama to take on a very talented Tigers squad. Ole Miss defeated Auburn earlier this year in The Pavilion. The two teams tip off at 7:30 p.m. (CT) and the game will be televised on the SEC Network.